The Incorruptibles are saints whose bodies are miraculously preserved after death, defying the normal process of decomposition. St. Cecilia is probably the first saint known to be incorrupt, but the bodies of these saints can be found in many places throughout the world. They are not like mummies, for their skin is soft and their limbs pliable, nothing at all like the dry, skeletal remains of mummies. 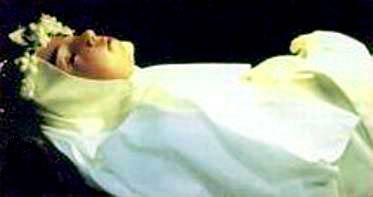 Under usual circumstances, nothing at all has been done to preserve the bodies of these saints. In fact, some of them have been covered in quicklime, which should have easily destroyed any human remains, yet it has no effect of these saints. Many of them also give off a sweet, unearthly odor, and others produce blood or oils that defy any scientific explanation. Modern science relegates the incorruptibles to the status of mummies, pretending it understands and can comfortably categorize these saints. How then do the scientists explain the fact that a year and a half after the death of St. Francis Xavier, a medical examiner placed a finger into one of the saint’s wounds and found fresh blood on his finger when he withdrew it? Or that when a finger was amputated from St. John of the Cross several months after his death, it was immediately observed that blood began to flow from the wound? Or the case of St. Nicholas of Tolentino, whose arms have frequently bled over the last 400 years? No, these saints are in a class by themselves. Even though incorruptibility does not automatically confer sainthood upon the subject, it is still properly appreciated by the Church as a supernatural occurrence. The truth is that these occurrences cannot be understood outside of Divine intervention on behalf of these saints, as the laws of nature have been suspended on behalf of the incorruptible saints. Perhaps it is that God is visibly showing us his pleasure with these saints? Still, it is a physical manifestation of God’s love, and the incorruptible saints console us by their presence, seeming to plead with us to likewise make ourselves pleasing to God in all ways. 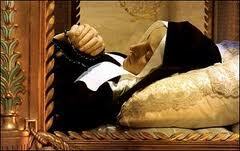 For more information about Incorrupt saints, we recommend the excellent book, The Incorruptibles, by Joan Carroll Cruz. The incorruptible bodies of saints are a consoling sign of Christ s victory over death, a confirmation of the dogma of the Resurrection of the Body, a sign that the Saints are still with us in the Mystical Body of Christ, and proof of the truth of the Catholic Faith—for only in the Catholic Church do we find this phenomenon. Impr. 342 pgs 33 Illus.